Gear reviews on this site are often few and far between, but if there's one thing I know a lot about, it's headphones. I probably go through headphones faster than the average person uses a disposable razor (in fact, I have gone through three pairs of headphones since the last time I replaced my razor blade). Maybe I am too abusive of these little earbuds that I keep popping into my ears day after day, but a product should be able to withstand a reasonable amount of abuse. How much can I really complain though? I score most of them for free, and I suppose you get what you pay for. I had one pair of Altec Lansing earbuds last for over two years (and, yes, I think that's a record for me), which survived many times through the washer and dryer, being stepped on, and many other misfortunes. My no-name advertisement branded pair that I got for free at those JellyNYC Pool Parties? No so long. 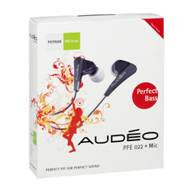 And so we come to the tale of my latest headphones, the Audeo Perfect Bass (RSP: $119). First off, as with a lot of nicer earbuds, they had various little plugs on the end that you could pick our size to adjust to your ear. I don't think I've ever had a harder time attaching these things to the actual headphone (perhaps it keeps them stuck on a little better if they are difficult to put on). After a struggle, I managed and stuck the things in my ear. The fit was excellent (and a good thing too, because I didn't want to think about removing those end pieces again). But the best thing about these headphones was that they were probably the best sounded earbuds I have used in a long time. I heard sounds on recordings that I had never noticed before. Crisp, clear, and isolated--the outside noise-blocking was incredible--if I used these exclusively at home, they would've great. But I have over-the-ear headphones for that; earbuds should be portable, which means that earbuds should be durable. And thus we get to the crux of my gripe. The good news is that they made it safely through their inaugural trip through my washer and dryer (and they still sounded great afterwards)! The bad news is that couldn't stand up to a little tugging. My earphones often get wrapped around my chair while being plugged into my computer. I pull my chair from the desk and MOST headphones pop out, leaving them wrapped around the bottom of my chair. Well, the Audeo Perfect Bass seemed to be a little stronger. Their weak point wasn't the connection at the computer. Nope, their weak point was the small microphone connection that hung from one of the earbuds. Ultimately, they lasted about two weeks before snapping in two, leaving me with a mono set of headphones and a dangling hire where the other ear once was. It's such a shame, because they did sound great.